If you live in Nashville, chances are you’re either in a band, playing music, promoting a band, or in the music industry. With everyone fighting for a few prime spots on the charts and in the best venues, you need to promote yourself. We’ve got three great ways to make your marketing dollars last while boosting your band’s brand. There’s no rest for the Nashville musician. You need to always be branding your band wherever you go. Twisted Concepts can wrap just about anything, so wherever you go, in whatever vehicle, you will be boosting your band’s brand at all times. Wrapping the band van is one of the most cost-effective ways to brand your band. The impressions you’ll create over and over by wrapping your band logo or artwork on your vehicle is worth every penny, and then some. For an established band that has graduated from a beat up band mini-van to a custom tour bus, we have the capability and space to wrap your tour bus. Let everyone know that you’re in town, when and where you’re playing. 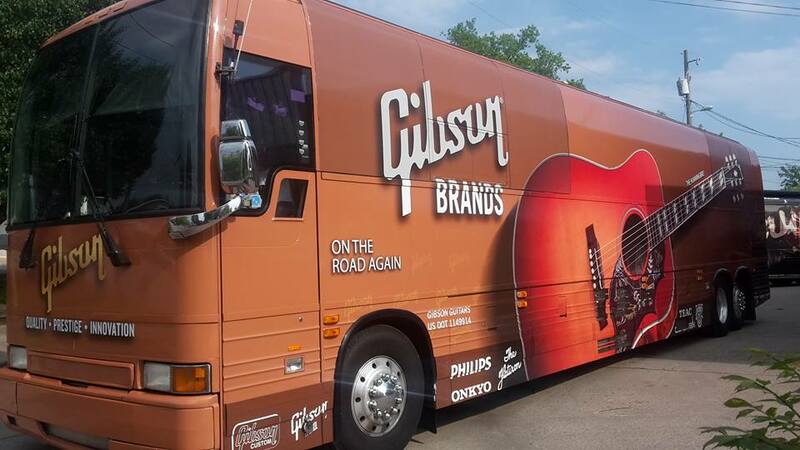 If your band logo and the artwork is wrapped around a tour bus, people are going to take notice, further boosting your brand. Of course, you won’t be driving your tour bus or band van on stage with you at every venue. But, when you’re starting out and you’re trying to get noticed and be memorable, every branding opportunity counts. When we say we wrap anything, we mean it, so what better item to wrap than your guitar? Sure, you can write your band name on the bass drum like every other band, or you can stand out with a custom guitar wrap. Besides wraps, we can create promotional and branding materials for all of your shows. Quality vinyl banners for shows are great if you’re playing festivals. Banners can be used a few ways. You can promote yourself at the show, but it’s also a great way to advertise your merch stand so that your fans know where to buy a t-shirt or a CD. The more you can saturate the market with your brand, the better your chances of being recognized and remembered. In any promotional or branding situation, it’s imperative that you have your vehicle wrap printed and installed by qualified professionals. Twisted Concepts in Nashville is capable of delivering the highest quality vinyl wraps in Nashville. That would be us. Call today for a quote!